Art Lab Gnesta is a place for experimental connections between art and society. 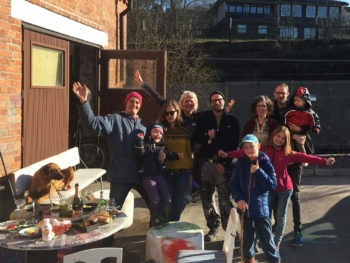 We create meetings between art and artists, the local community, schools, art institutions and others who work with issues related to art or society – locally, in Sweden, and abroad. We have our home in the old brewery in Gnesta, where we have studios, meeting rooms and an art gallery. We put on exhibitions, arrange workshops, publish, and arrange talks and other events both in the brewery, in public spaces and at those we collaborate with. In our residency program, we invite artists to come and experiment, producing new art that inspires discussions about our time and its challenges. The exhibition program allows us to present these issues through the work of invited artists. With our feet in the Sörmland railway town of Gnesta and our vision firmly forwards, we provide a place for production, presentation and discussion. Art Lab Gnesta is an independent initiative created in 2010 and run by the Art Lab Gnesta Association. We are grateful to Gnesta Municipality, Sörmland County Council, the Swedish Arts Council, BUS/KUN, Leader Inlandet, the Swedish Inheritance Fund, Konstfrämjandet (People’s Movements for Art Promotion), Kulturbryggan, the Helge Ax:son Johnson Foundation, Nordic Culture Point, Konstfrämjandet (People’s Movements for Art Promotion), the Swedish Institute, and the Karl Schultz-Köln and Marita Mörck-Schultz Foundation.